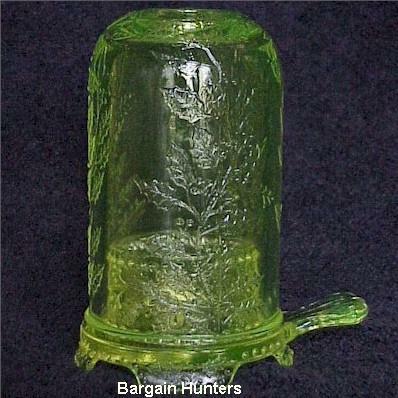 Holly & Berry Fairy Light in Vaseline, Bargain Shack offers Boyd Glass, Mosser Glass, L.G. Wright, and Contemporary Collectible Glass including Vaseline Glass - J.B. Scottie Dogs, Pooche, Animal Covered Nests, Toothpick Holders, Salts, Glass Animal Figurines, Clowns, Dolls, Slippers, Vehicles, and More! This beautiful Holly & Berry Fairy light in Vaseline stands almost 5-1/2" tall. Decorated with holly this is a two-piece fairy light. Add your favorite scented candle and fill your home with warmth and fragrance. Made from vaseline glass it has a great glow under a blacklight!